I’ve barely finished wiping the tears from my eyes as I head to the computer to review this stunning, heartbreaking, and alas, honest, children’s book. What has shocked me and kept me reading right through, was the recognition that I had never confronted head on the reality of Palestinian life after Israel was created. This children’s book is brutally honest, at the same time, filled with humor, interesting characters, and great drama. It also leaves us with some sense of hope that somehow, healing will happen in a land that is holy to Muslims, Jews, and Christians. Maybe that healing begins with children reading books like this, side by side with something like The Diary of Anne Frank. And then, discussing it all, and trying to remove hatred and find solutions. The power of literature to make a change stands out to me as I read this children’s book. Literature can bring us vividly into the life of others, to walk in their shoes, to feel their pain and frustration, and in the end, to summon up hope for a better future. This book has it’s bias, for sure, as it is presenting only one side of a deadly conflict, but it serves the purpose of presenting the humanitarian issues in Palestine. It’s not a political view, about who the land belongs to, or what should be done. The book doesn’t offer any answers to the mess in the Middle East. Because of the difficult situation described, I recommend this book for 12 and up. I would recommend it for any classroom trying to understand the Middle East, and for any family wanting to open their hearts to the pain of the world. 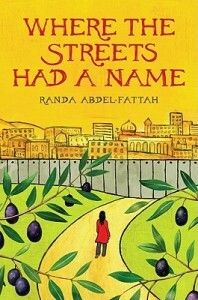 The book provides no background to the Palestinian/Israeli conflict, so prior to reading the book, it would help if young readers are given some context. It would also help to about both sides of the conflict, so that the real dilemma can be presented and discussed. Yes, this is a lot of work to go through for a children’s book. But I think it is important part of educating the young people in our world.